Gottfried Leibniz (1646-1716) was a German mathematician and philosopher. He occupies a prominent place in the history of mathematics and the history of philosophy. Leibniz developed the infinitesimal calculus independently of Isaac Newton, and Leibniz's mathematical notation has been widely used ever since it was published. It was only in the 20th century that his Law of Continuity and Transcendental Law of Homogeneity found mathematical implementation (by means of non-standard analysis). He became one of the most prolific inventors in the field of mechanical calculators. While working on adding automatic multiplication and division to Pascal's calculator, he was the first to describe a pinwheel calculator in 1685 and invented the Leibniz wheel, used in the arithmometer, the first mass-produced mechanical calculator. He also refined the binary number system, which is at the foundation of virtually all digital computers. In philosophy, Leibniz is most noted for his optimism, and his conclusion that our Universe is, in a restricted sense, the best possible one that God could have created. Leibniz,along with René Descartes and Baruch Spinoza, was one of the three great 17th century advocates of rationalism. The work of Leibniz anticipated modern logic and analytic philosophy, but his philosophy also looks back to the scholastic tradition, in which conclusions are produced by applying reason to first principles or prior definitions rather than to empirical evidence. Leibniz made major contributions to physics and technology, and anticipated notions that surfaced much later in philosophy, probability theory, biology, medicine, geology, psychology, linguistics, and computer science. He wrote works on philosophy, politics, law, ethics, theology, history, and philology. Leibniz's contributions to this vast array of subjects were scattered in various learned journals, in tens of thousands of letters, and in unpublished manuscripts. He wrote in several languages, but primarily in Latin, French, and German. There is no complete gathering of the writings of Leibniz. Leibniz's mother was Catharina Schmuck, the daughter of a lawyer and Friedrich Leibniz's third wife. However, Friedrich Leibniz died when Leibniz was only six years old and he was brought up by his mother. Certainly Leibniz learned his moral and religious values from her which would play an important role in his life and philosophy. At the age of seven, Leibniz entered the Nicolai School in Leipzig. Although he was taught Latin at school, Leibniz taught himself far more advanced Latin and some Greek by the age of 12. He seems to have been motivated by wanting to read his father's books. As he progressed through school he was taught Aristotle's logic and theory of categorizing knowledge. Leibniz was clearly not satisfied with Aristotle's system and began to develop his own ideas on how to improve on it. In later life Leibniz recalled that at this time he was trying to find orderings on logical truths which, although he did not know it at the time, were the ideas behind rigorous mathematical proofs. As well as his school work, Leibniz studied his father's books. In particular he read metaphysics books and theology books from both Catholic and Protestant writers. 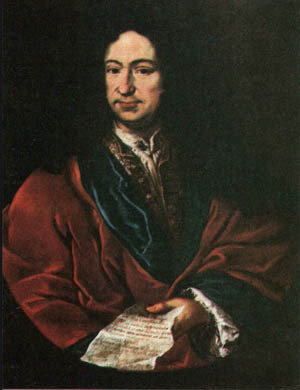 In 1661, at the age of fourteen, Leibniz entered the University of Leipzig. It may sound today as if this was an exceptionally early age for anyone to enter university -- and it is fair to say that by the standards of the time he was quite young but there would be others of a similar age. He studied philosophy, which was well taught at the University of Leipzig, and mathematics which was very poorly taught. Among the other topics which were included in this two-year general degree course were rhetoric, Latin, Greek and Hebrew. He graduated with a bachelor’sdegree in 1663 with a thesis De Principio Individui -- On the Principle of the Individual -- which emphasized the existential value of the individual, who is not to be explained either by matter alone or by form alone but rather by his whole being. In this there is the beginning of his notion of "monad". Leibniz then went to Jena to spend the summer term of 1663. At Jena the professor of mathematics was Erhard Weigel, but Weigel was also a philosopher and through him Leibniz began to understand the importance of the method of mathematical proof for subjects such as logic and philosophy. 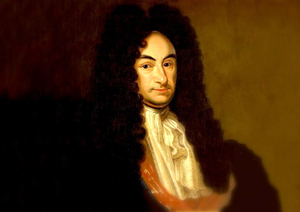 By October 1663 Leibniz was back in Leipzig starting his studies towards a doctorate in law. He was awarded his Master's Degree in philosophy for a dissertation which combined aspects of philosophy and law studying relations in these subjects with mathematical ideas that he had learned from Weigel. A few days after Leibniz presented his dissertation, his mother died. After being awarded a bachelor's degree in law, Leibniz worked on his habilitation in philosophy. His work was to be published in 1666 as Dissertatio de arte combinatoria -- Dissertation on the combinatorial art. In this work, Leibniz aimed to reduce all reasoning and discovery to a combination of basic elements such as numbers, letters, sounds and colors. According to Leibniz, a conception of truth has important consequences for a conception of reality and how it is to be understood at its most profound level. Intuitively, a proposition is true when its content is adequate to the situation in the world to which it refers. For example -- “the sky is gray” is true if and only if the thing out there in the world called “the sky” is actually the color called “gray” at the time the proposition is stated. This, however, raises issues about the relationship of language to the world and what “adequacy” consists in. Leibniz claims that one can bypass problems with the intuitive notion of truth, at least for the moment. Truth, according to Leibniz, is simply a proposition in which the predicate is contained in the subject. The predicate is what is asserted; the subject is what the assertion is about. All true propositions, then, can be expressed by the following general form --subject is predicate. This is not, by any means, an idea unique to Leibniz. What is unique, however, is the single-mindedness with which he pursues the consequences of such an idea of truth. This notion of truth seems straight-forward enough for what are commonly called analytic propositions, such as blue is a color which has more to do with the definition of blue than it does with the world. The notion of color is part of the notion of blue. Similarly, in the basic logical truth A is A-- the predicate is not just contained in the subject, it is the subject. But, Leibniz states that thisbeing contained is implicitly or virtually the case with other truths. Take, for example, the statement Peter is ill. Intuitively, this proposition is true only if it refers to a real world in which Peter is, in fact, ill. Leibniz, however, analyzes this as follows: if one knew everything there is to know about Peter, that is, if one had a complete concept of Peter, one would also know (among many other things) that he is ill at the moment. Therefore, the statement “Peter is ill” is true not primarilybecause of some reference to the world, but in the first instance because someone has the concept of Peter, which is the subject of the proposition, and that concept contains (as a predicate) his being ill. Of course, it may be the case that one happens to know that Peter was ill because one refers to the world (perhaps sees him cough repeatedly). But the fact that one finds out about Peter in this way does not make the statement that “Peter is ill” true and thus a piece of knowledge because of that reference. One must distinguish the concept of truth from pragmatic or methodological issues of how one happens to find out about that truth, or what one can do with the truth. The latter, according to Leibniz, are completely irrelevant to the question What is truth? in itself. Identity of indiscernibles. Two distinct things cannot have all their properties in common. If every predicate possessed by x is also possessed by y and vice versa, then entities x and y are identical; to suppose two things indiscernible is to suppose the same thing under two names. Frequently invoked in modern logic and philosophy. The "identity of indiscernibles" is often referred to as Leibniz's Law. It has attracted the most controversy and criticism, especially from corpuscular philosophy and quantum mechanics. Sufficient reason -- There must be a sufficient reason -- often known only to God -- for anything to exist, for any event to occur, for any truth to obtain. Pre-established harmony -- The appropriate nature of each substance brings it about that what happens to one corresponds to what happens to all the others, without, however, their acting upon one another directly. A dropped glass shatters because it knows it has hit the ground, and not because the impact with the ground compels the glass to split. Law of Continuity -- Natura non saltum facit. Optimism -- God assuredly always chooses the best. Plenitude -- Leibniz believed that the best of all possible worlds would actualize every genuine possibility, and argued in Théodicée that this best of all possible worlds will contain all possibilities, with our finite experience of eternity giving no reason to dispute nature's perfection. Leibniz is credited, along with Sir Isaac Newton, with the discovery of infinitesimal calculus (that comprises differential and integral calculus). According to Leibniz's notebooks, a critical breakthrough occurred on November 11, 1675, when he employed integral calculus for the first time to find the area under the graph of a function y = ƒ(x). He introduced several notations used to this day, for instance the integral sign ∫ representing an elongated S, from the Latin word summa and the d used for differentials, from the Latin word differentia. This cleverly suggestive notation for the calculus is probably his most enduring mathematical legacy. Leibniz did not publish anything about his calculus until 1684. The product rule of differential calculus is still called Leibniz's law. In addition, the theorem that tells how and when to differentiate under the integral sign is called the Leibniz integral rule. 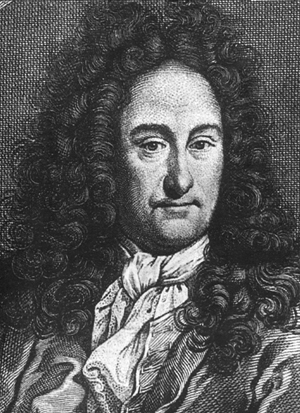 Leibniz exploited infinitesimals in developing the calculus, manipulating them in ways suggesting that they had paradoxical algebraic properties. George Berkeley, in a tract called The Analyst and also in De Motu, criticized these. A recent study argues that Leibnizian calculus was free of contradictions, and was better grounded than Berkeley's empiricist criticisms. From 1711 until his death, Leibniz was engaged in a dispute with John Keill, Newton and others, over whether Leibniz had invented the calculus independently of Newton. This subject is treated at length in the article Leibniz-Newton controversy. Infinitesimals were officially banned from mathematics by the followers of Karl Weierstrass, but survived in science and engineering, and even in rigorous mathematics, via the fundamental computational device known as the differentials. Beginning in 1960, Abraham Robinson worked out a rigorous foundation for Leibniz's infinitesimals, using model theory, in the context of a field of hyperreal numbers. The resulting non-standard analysis can be seen as a belated vindication of Leibniz's mathematical reasoning. Robinson's transfer principle is a mathematical implementation of Leibniz's heuristic law of continuity, while the standard part function implements the Leibnizian transcendental law of homogeneity.